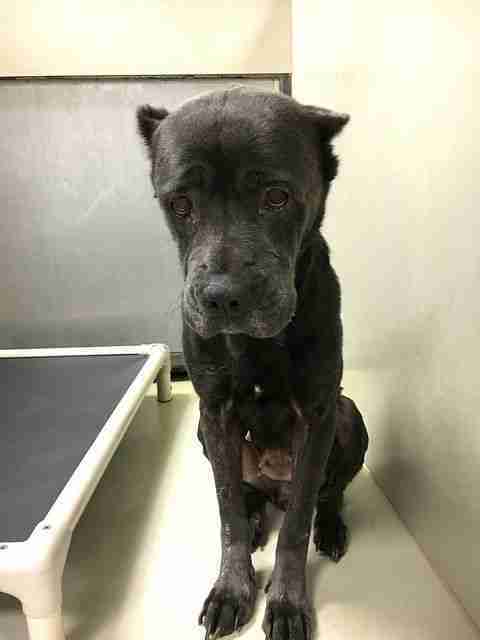 By the time she was found, left to die alone tied to a pole, this dog couldn't have looked more forlorn and defeated. But despite the untold trauma and mistreatment in her past, hers is a story of hope. 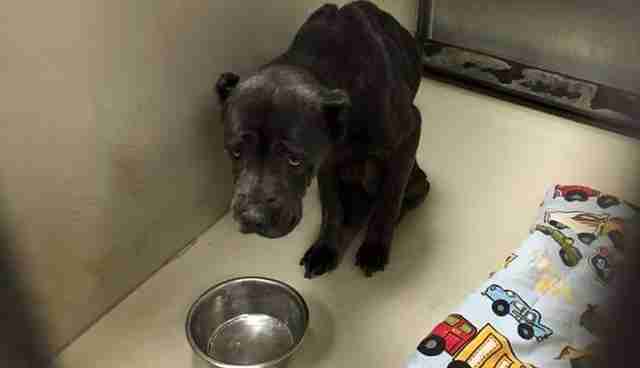 Even after being sent to the relative safety of a Philadelphia animal control center, the abandoned dog's heartbroken disposition failed to improve. There, shelter workers tried their best to draw her out from that dark cloud, not merely to make her feel better, but because her life depended on it. Still, nothing seemed to work. "She was sitting sadly in her kennel, so frightened that she wouldn't lift her head for treats," Bridget, a volunteer at the shelter, told The Dodo. "[That put her] at risk for getting euthanized because she was so scared and the shelter couldn't safely evaluate her." Knowing that the pup's time was running short at the crowded shelter, where timid pets like her are among the least likely to be adopted, Bridget turned to social media for help. Photos she shared of the defeated dog cowering in her lonely kennel spread quickly among her animal-loving friends on Facebook. "Saddest face I have ever seen," wrote one commenter. "I just want to kiss her and love her and tell her everything will be okay." Within hours, the dog's photo had been shared more than 500 times - and by the end of the day, her life was saved when a rescue group read her story and stepped in to give her sanctuary, and a new name: Perriwinkle. "She actually went to an awesome rescue called Sperenza Animal Rescue. They will help rehabilitate her and see how she is and when she is ready, find a good home for her," said Bridget. "If we didn't share that pic ... she would be gone." Once out of her kennel, and out of danger, Perriwinkle could finally rest easy. Sadly, there are countless adoptable animals like this one who, having suffered from trauma and abuse, need more time and patience to recover than many shelters will afford them. That's where caring folks, like Bridget, come in - but they can't do it alone. "We are all members of an important village," she said. "There is a saying, it takes a village to save an animal." To learn how you can donate your time to helping animals, contact your local animal shelter.